Other Names: Terry Allen, "America's Heartthrob"
- Mid-South Superdome Extravaganza (July 16, '83) = Magnum TA won, via DQ, over Buzz Sawyer. - Mid-South Superdome Extravaganza (November 19, '83) = Magnum TA & Mr. Wrestling II fell to the Road Warriors. - Mid-South Superdome Extravaganza (April 7, '84) = Magnum TA lost to the Mid-South North American Champion, Mr. Wrestling II. - Mid-South Superdome Extravaganza (June 16, '84) = Magnum TA retained the Mid-South North American Title, winning a "No Disqualification" Match over Ted DiBiase. - Mid-South Superdome Extravaganza (November 22, '84) = Magnum TA won, via DQ, over the North American Champion, Ernie Ladd. - NWA Great American Bash '85 (July 6) = Magnum TA retained the NWA United States Heavyweight strap, winning, via DQ, over Kamala. - NWA Hawaii Polynesian Hot Summer Night (August 3, '85) = America's Team (Magnum TA & Dusty Rhodes) beat Nikita Koloff & Krusher Khruschev. - AWA SuperClash (September 28, '85) = Magnum TA lost to the NWA World Heavyweight Champion, Ric Flair. - NWA Starrcade '85 (November 28) = Magnum TA won the NWA United States Heavyweight Title, winning a "Steel Cage I Quit" Match over Tully Blanchard. - NWA/AWA Star Wars (December 29, '85) = Magnum TA took down Tully Blanchard. - NWA Pacific Northwest Superstar Extravaganza (January 21, '86) = Magnum TA & the Road Warriors defeated Timothy Flowers & the Koloffs. - NWA/AWA Star Wars (February 24, '86) = Magnum TA lost to the NWA World Heavyweight Champ, Ric Flair. - NWA/AWA Rage in a Cage (April 28, '86) = Magnum TA retained the NWA United States Heavyweight Title, beating Baron Von Raschke. - NWA Great American Bash '86 (July 5) = America's Team & Baby Doll won a "Steel Cage" Match over Jim Cornette & the Midnight Express. 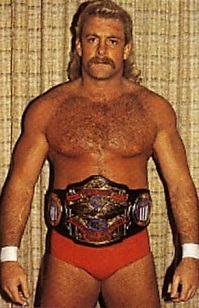 - NWA Great American Bash '86 (July 26) = Magnum TA pinned Nikita Koloff. - NWA United States Tag-Team Title Tournament (September 28, '86) = America's Team defeated Baron Von Raschke & Shaska Whatley, then fell to the eventual winners, Ivan Koloff & Krusher Khruschev.